December's update includes a variation on the Buchschmid and Gretaux Flower picture theme. The picture seen on this page does not turn up very regularly, in fact, this is the first example we have seen with the Chrysanthemums feature. 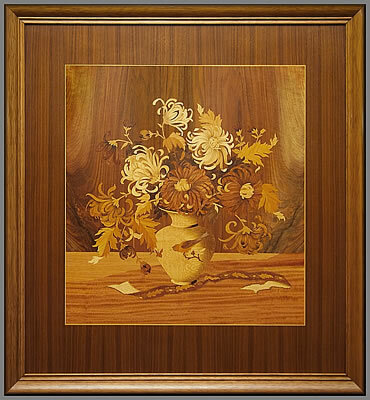 Our December Buchschmid and Gretaux picture is another example of the beautiful flower series produced by the B & G Wood Inlay Company. The picture is from their largest size "Series 1" production and is in the size range of from 24.5” x 17.25” to 20.25” x 12.5”. This translates into metric as 62 x 44 cm's to 51.5 x 32 cm's. Ron Watkins, the owner of this superb piece, tells us that he has not been able to find reference to any other examples of this subject. Roses it seems, are comparatively plentiful in relative terms (possibly around a handful at most for the roses) but, Chrysanthemums, are a totally different item, they seem to have the rarity of the proverbial "Hen's Teeth". Perhaps it may be to do with the petal arrangements of Chrysanthemums, being that they are multitudinous and highly individual in their flower head styles. The execution in veneer of such delicate and repetitive work would require many man hours in cutting and assembling. So, mass production of this subject in hand cut (or even saw/packet cut) veneers would, more or less, be most unlikely unless a prohibitive initial price were charged for the piece. Herr. Otto Chlup of the ABC Studios tells us that some pieces or titles were only produced in quantities of less than ten examples. Perhaps the Chrysanthemum subject is one of them. 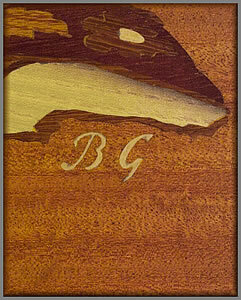 If you, our visitor, has another example of this subject, perhaps you may like to get in touch with us and tell us about your superb B & G Wood Inlay picture. Click the above button to return to page 22 of "Can You Help"
Click the above button to visit page 24 of "Can You Help"